Wilson MacDonald is one of Canada's best-known poets. He is also a socialist of long standing. Albert Einstein, after a trip to Canada, once wrote: "The greatest thing I discovered in Canada was Wilson MacDonald. Canada must be proud of this great genius writing in her midst." A Song of Color was inspired by the news of the exclusion of Autherine Lucy from the University of Alabama. 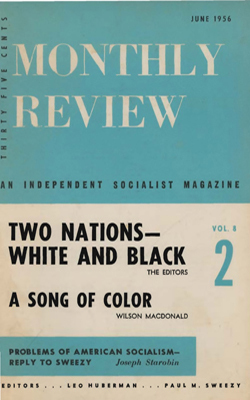 It was originally published in the Toronto Star on Mr. MacDonald's stipulation that he be allowed to give it free distribution thereafter throughout the world. He sent the poem to MR through his close friend Scott Nearing, and we are proud to be the first to publish it in the United States. -Eo.